Back to school for me means the return to normal routines and this year in particular, a return to the gym and some healthy eating...hopefully. Salmon is my favorite fish and it's a great choice because it packs a lot of flavor punch when you're trying to stay away from adding heavy sauces. Here I've coated a cut up salmon fillet with a yogurt marinade and grilled it up for a quick and easy dinner. I like to double skewer the meat so that it's easy to flip in the grill pan. These would also make a great do-ahead dish for a BBQ. Cut the salmon fillets into 1" chunks. Mix the yogurt, celery salt, horseradish and lemon juice together in a medium bowl. Add the salmon to the yogurt mixture and stir gently to coat. Coat a grill pan with cooking spray and place over a medium-high flame. 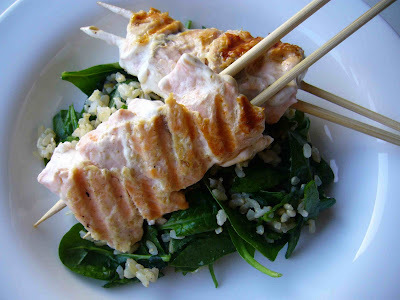 While the pan is heating up, skewer the salmon, using 4 - 6 pieces per skewer. Grill for 4 - 5 minutes on each side and enjoy! *I served the salmon with a really quick salad of spinach and brown rice. Simply prepare brown rice and while it is still steaming, place 2 cups of rice in a bowl with two big handfuls of spinach. Stir so that the heat from the rice, wilts the spinach. I also stirred in a 1/4 t of celery salt to mimic the flavor in the salmon. This is the kind of dish that reconciles me to healthy eating though! I love salmon, especially grill salmon. Salmon+spinach=SUPERFOOD! I'm so with ya on the return to the gym! I think I went 4 times all summer. My waist shows it too. I love salmon...but can't get Phil to touch it. The only fish that I can get him to eat is fish and chips. I see that you used Fage. I love that stuff! Next time he has a business trip I'll have to remember your Salmon Skewers. Kittie - I can only stomach healthy eating if it's delicious too. Hopefully I'll be able to come up with enough deliciousness to stay on the healthy kick. Elra - Thanks for stopping by. Grilled salmon is delicious isn't it? Michele - The boyfriend won't eat salmon either. It's really depressing since it's my favorite fish. I did get him to enjoy some sablefish (totally different than salmon but fish just the same) last weekend so maybe Phil would go for that? I love this dish! I never skewered salmon before because I was afraid it will fall off on the grill, so your idea of using two skewers is a great idea. Nora -Thanks for stopping by Apples and Butter! Christine - Thank you! It was definitely a melted mess. Thank goodness we eventually grow up and, hopefully, learn from our mistakes!